Via Ferrata means “iron path” in Italian and is an increasingly popular mix of protected climbing and alpine hiking where participants use climbing gear to safely ascend exposed routes with spectacular views while attached at all times to iron cables, rungs, ladders and bridges. 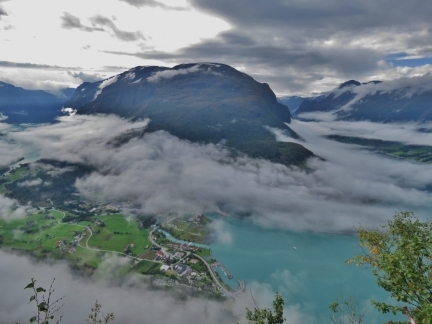 A number of Via Ferratas have opened in Norway in recent years, and the one at Loen is among the best. The route climbs up 3,316ft (1,011m) Mt Hoven and includes a 393ft (120m) suspension bridge (the longest Via Ferrata bridge in Europe), and an 118ft (36m) wire bridge that Jennifer is crossing in the picture above. This was the first time we’d taken a Via Ferrata—we had an awesome time and are looking forward to trying it again. Our tender moored at the Hotel Alexandra marina for the day. 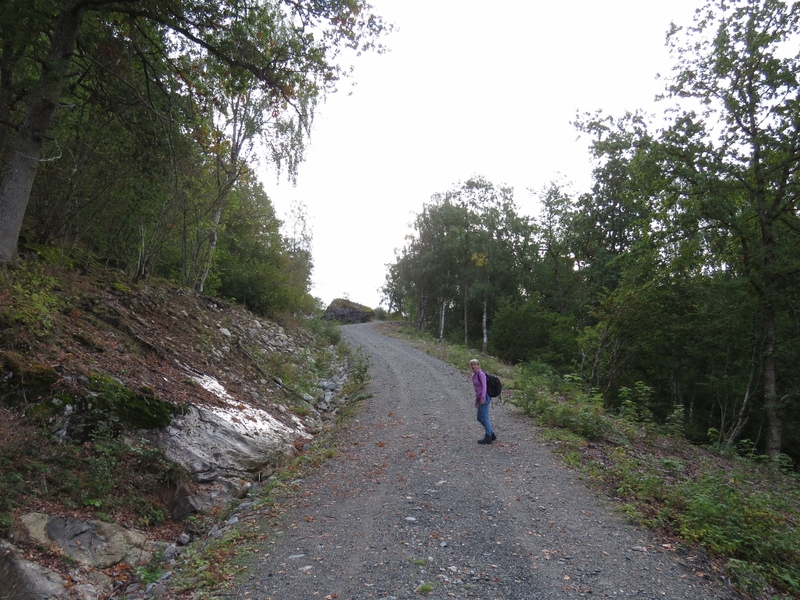 Walking the steep road to reach the trailhead for our climb to the summit of 3,316ft (1,011m) Mt. 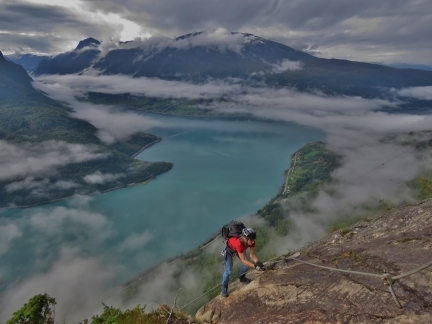 Hoven on the Via Ferrata Loen. That suspension bridge way up there is part of our route to the summit of Mt. Hoven. One of the Loen Skylift gondolas rising up out of the mist behind us. 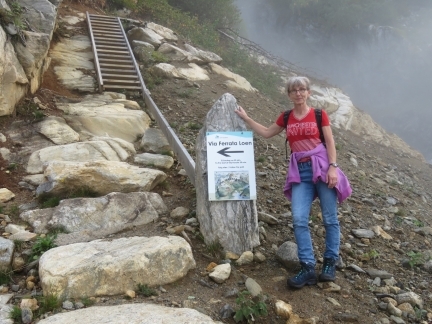 We reached the trailhead after walking up a steep roadway to 654 ft (199 m). We’ll be taking the Via Ferrata Loen up. 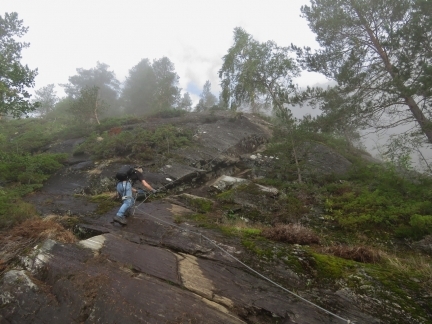 Via Ferrata means “iron path” in Italian and is an increasingly popular mix of protected climbing and alpine hiking where participants use climbing gear to safely ascend exposed routes with spectacular views while attached at all times to iron cables, rungs, ladders and bridges. We popped above the clouds at altitude 726 ft (221 m) for great views to the south. We donned our climbing gear when we reached the first section where we could clip on at altitude 1021 ft (311 m). 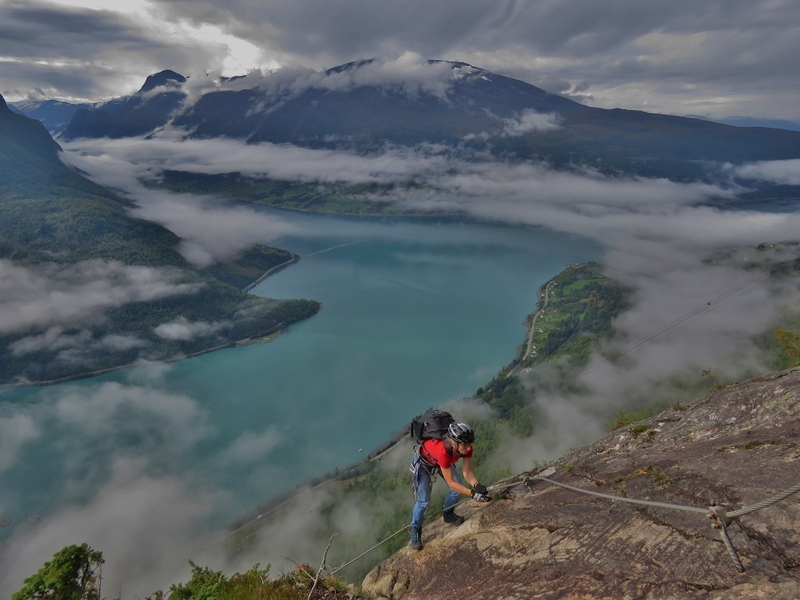 We carry climbing gear on the boat so we can safely work on the stack and other places where we might fall. This is the first time we’ve used the gear for sport. 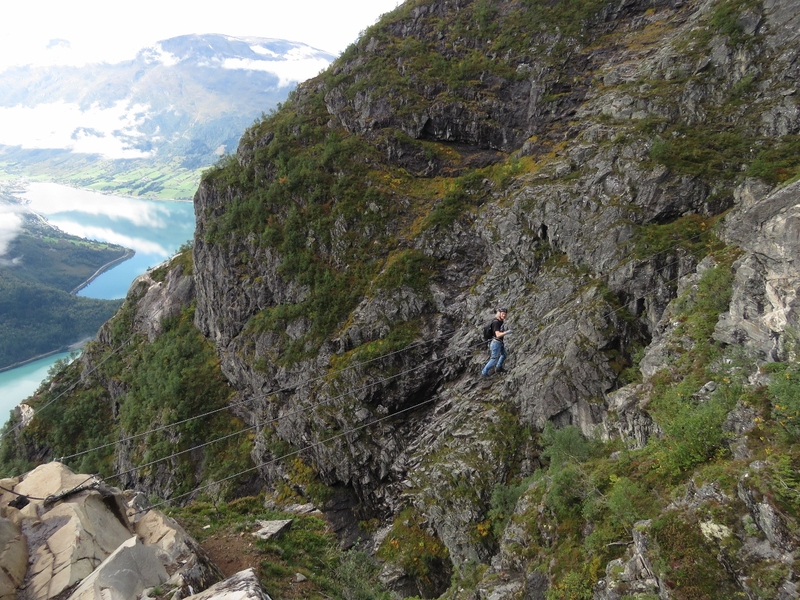 Jennifer starting up the cliff, clipped onto the wire. 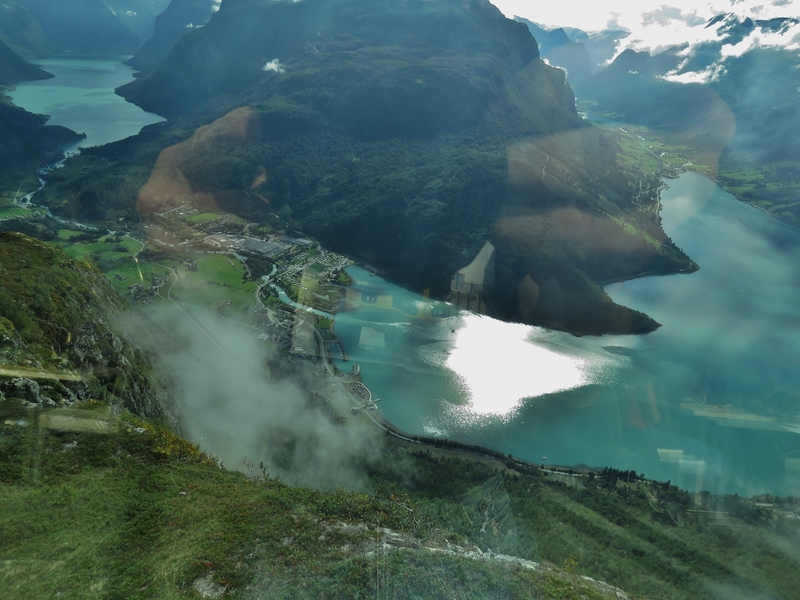 Another great view at altitude 1169 ft (356 m). 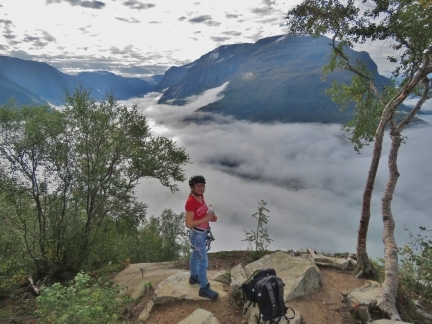 James ascending into the clouds at altitude 1595 ft (486 m). 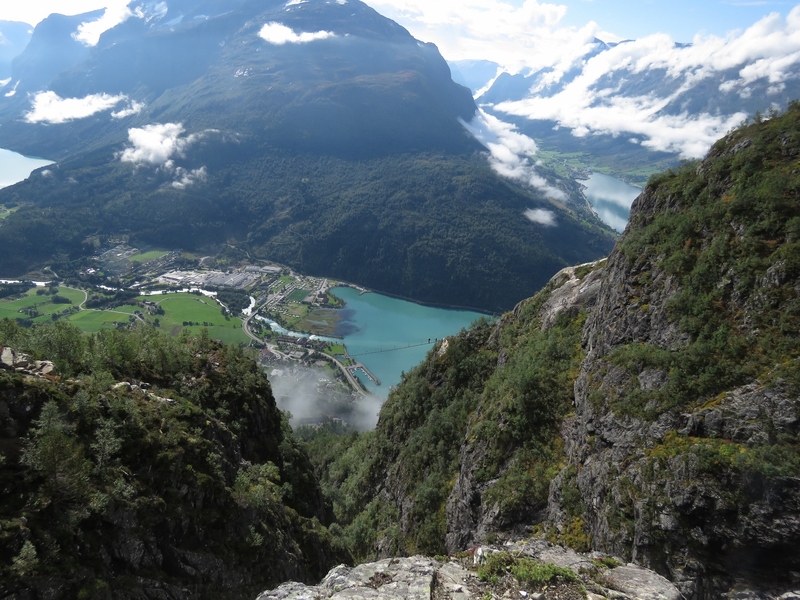 Taking a break and enjoying the view across the Lodalen valley at altitude 1999 ft (609 m). 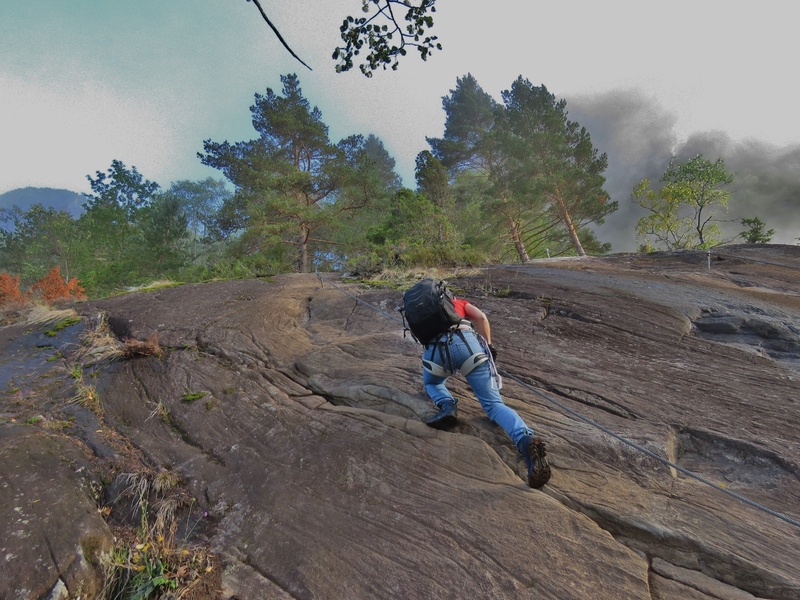 Ascending at altitude 2406 ft (733 m). Dirona moored far below us, viewed from an altitude of 2507 ft (764 m). 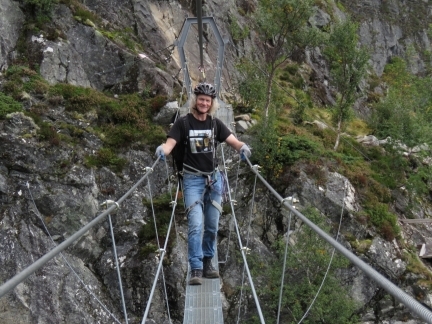 James crossing the Gjolmunne suspension bridge, 2,400 ft up (731m), clipped on behind him to the overhead cable above his head. 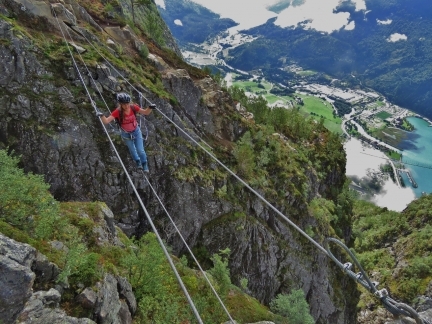 The 393ft (120m) bridge is the longest Via Ferrata bridge in Europe. 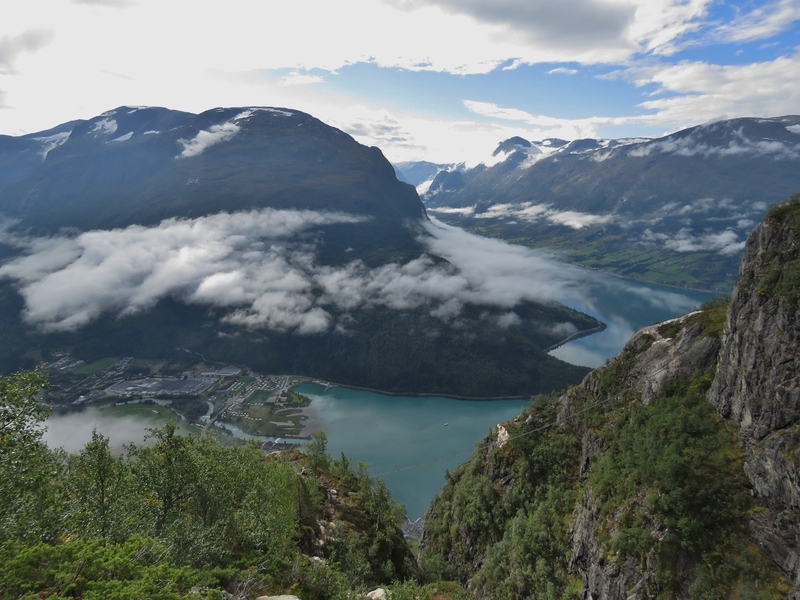 It was pictures of this bridge, with a view to Nordfjorden beyond, that had first attracted us to the hike. Jennifer crossing the Gjolmunne suspension bridge with Nordfjorden beyond. The marina where our tender is moored is visible at the far left. 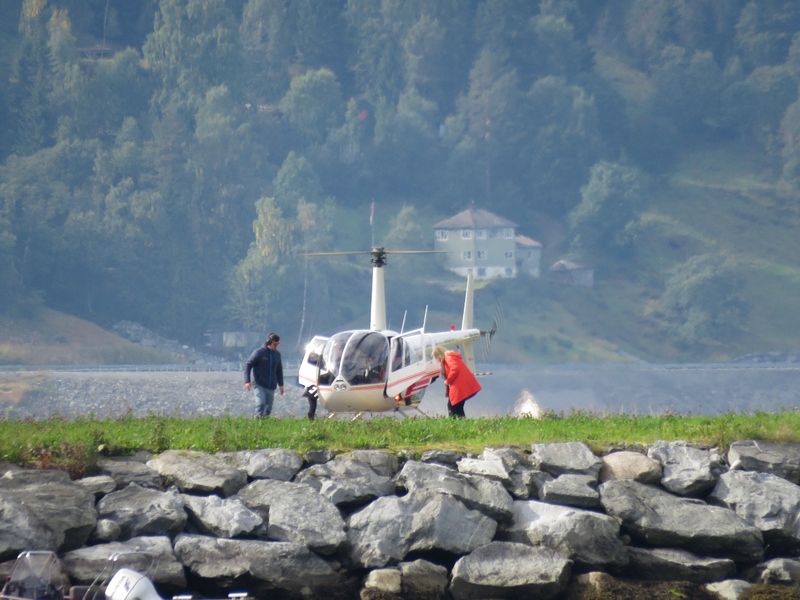 Jennifer ringing the bell after crossing the Gjolmunne suspension bridge. Another great view at altitude 2760 ft (841 m). 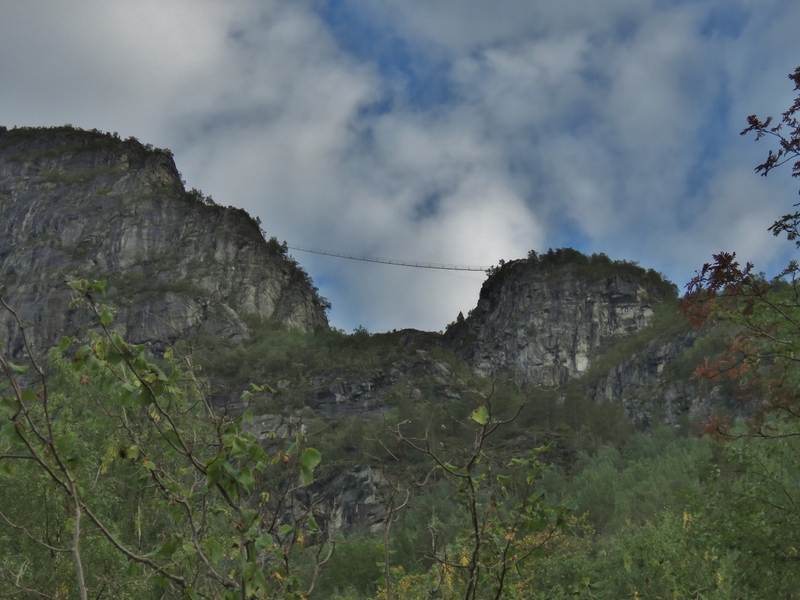 The 118ft (36m) Gjolmunne wire bridge was the part of the ascent we were most concerned about. It wasn’t too bad close to the ends, but in the middle the wire rope moves quite a bit and it was a little, um, exciting. 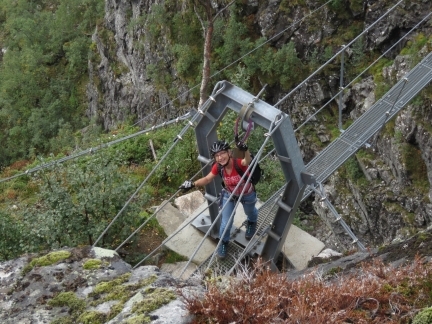 Here Jennifer is making her way across clipped to and holding onto the cables on either side. 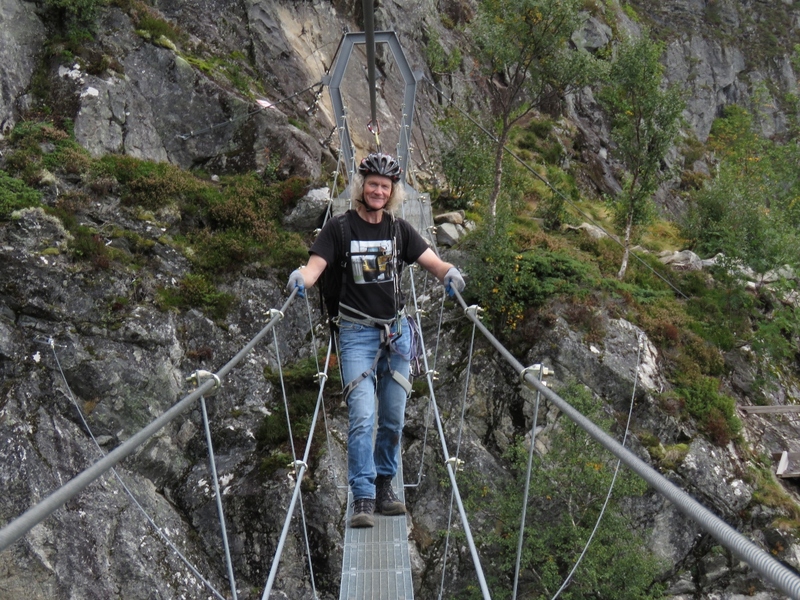 James crossing the Gjolmunne wire bridge. 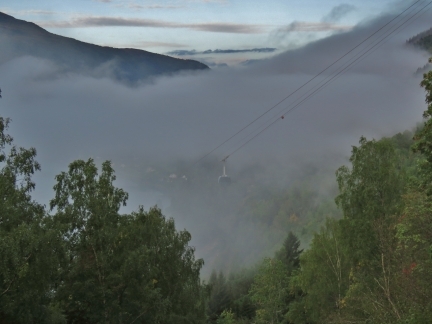 At altitude 2842 ft (866 m) we could see another set of climbers crossing the Gjolmunne suspension bridge 442ft (135m) below. 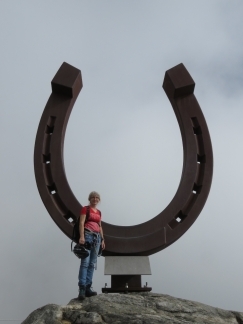 5m-high horseshoe on the Hoven summit at 3,316ft (1101m). 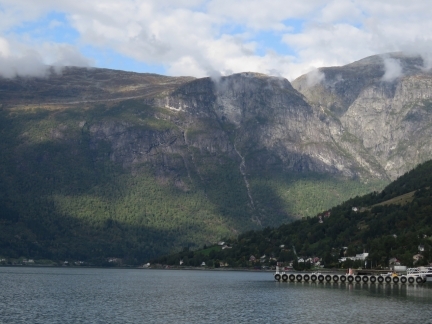 Hoven means “hoof” in Norway—the mountain is named for the Sleipner, the horse of the god Odin in Norse mythology. This was the first time we’d taken a Via Ferrata. We had an awesome time and are looking forward to trying it again. 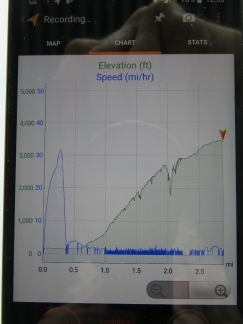 Our climb profile for Via Ferrata Loen. 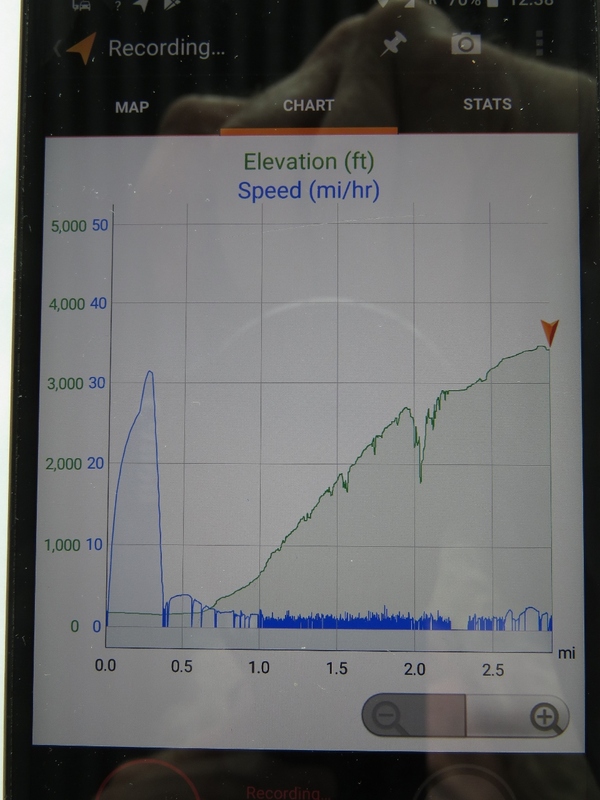 The blue line represents speed and the green is altitude. You can see the quick blast to shore in the tender at just over 30mph at the far left and our ascent up Mt. 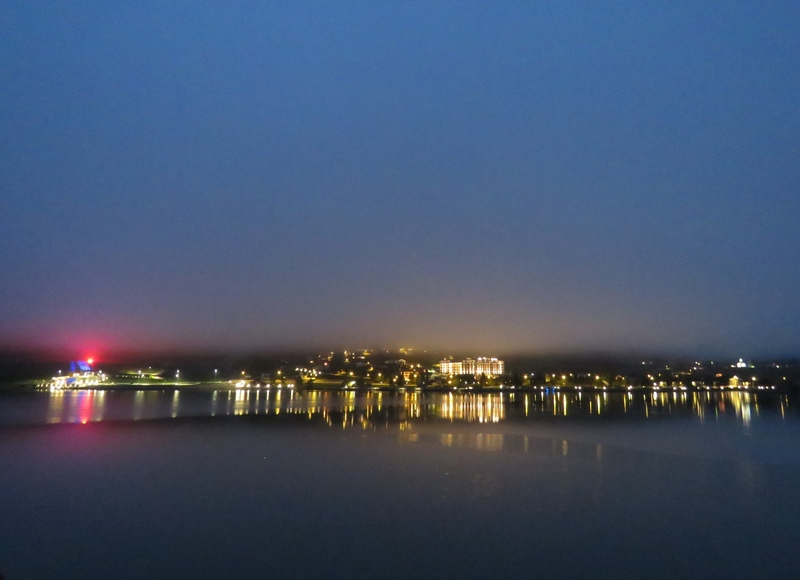 Hoven at about 1mph. There aren’t many places in the world where you can climb to over 3,000ft and have lunch at a high-end restaurant. 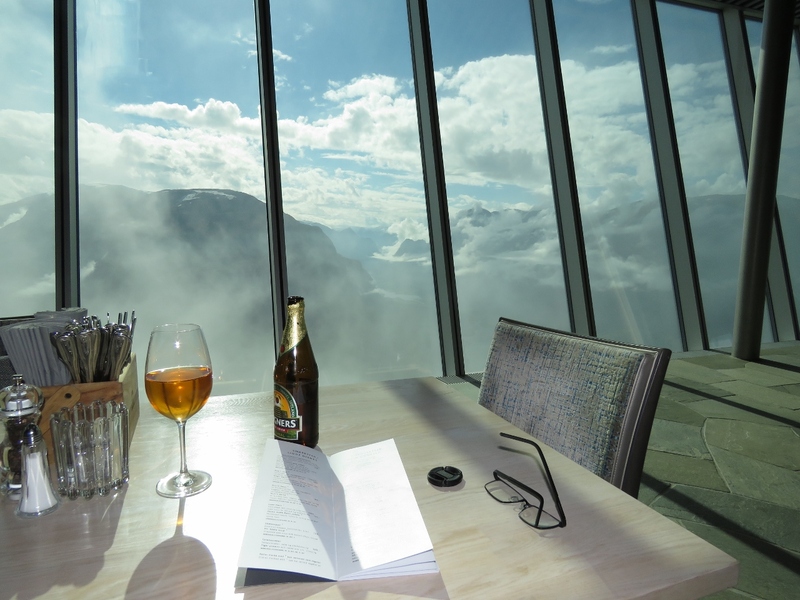 We had an excellent, lazy lunch at Hoven restaurant with fabulous views to Nordfjorden. 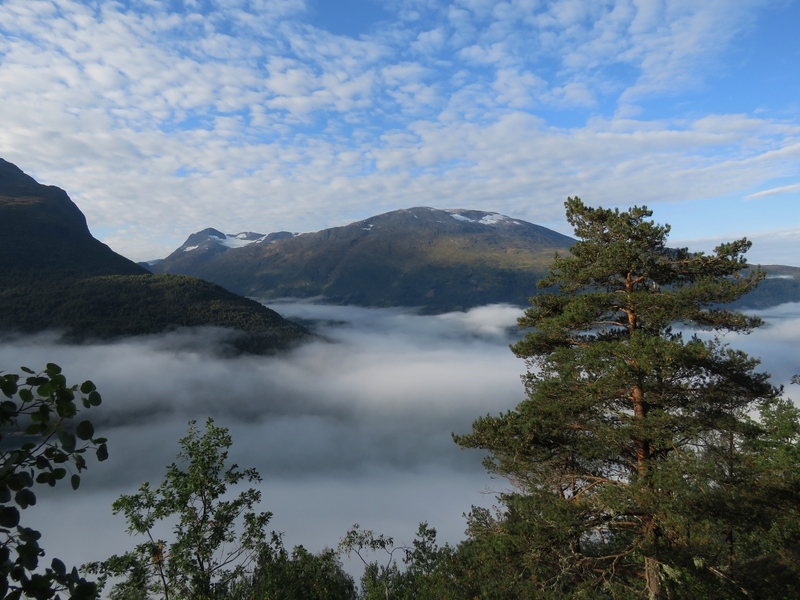 The clouds came and went frequently while we were there, giving us a constantly changing view. 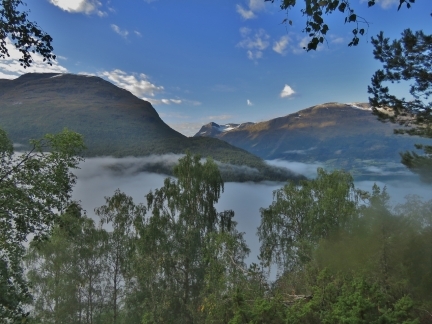 Sweeping view to the Lodalen valley from Hoven restaurant. Dirona is a small white speck at center, just left of the large sun reflection in the water (click image for a larger view). 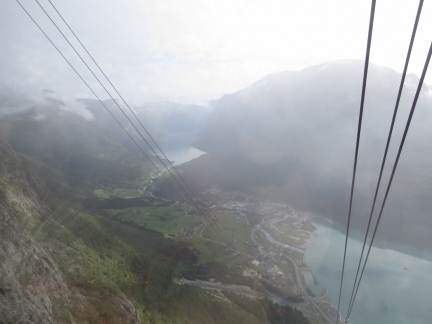 Looking down to Loen and the Lodalen valley from a Loen Skylift gondola as we descend. 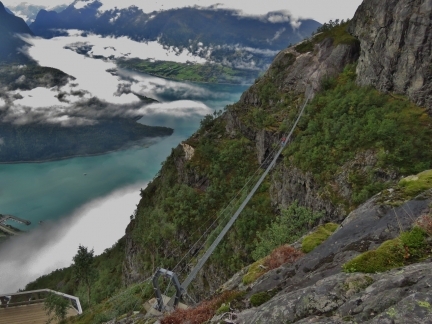 The Loen Skylift is one of the steepest in the world, with a maximum gradient of 60 degrees. And it’s all on a single cable run with no supporting towers in between the top and bottom. Impressive engineering. 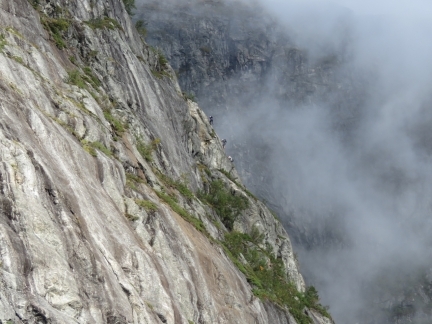 Climbers making their way up Via Ferrata Loen on the route we just took. This is not a pastime for those afraid of heights. 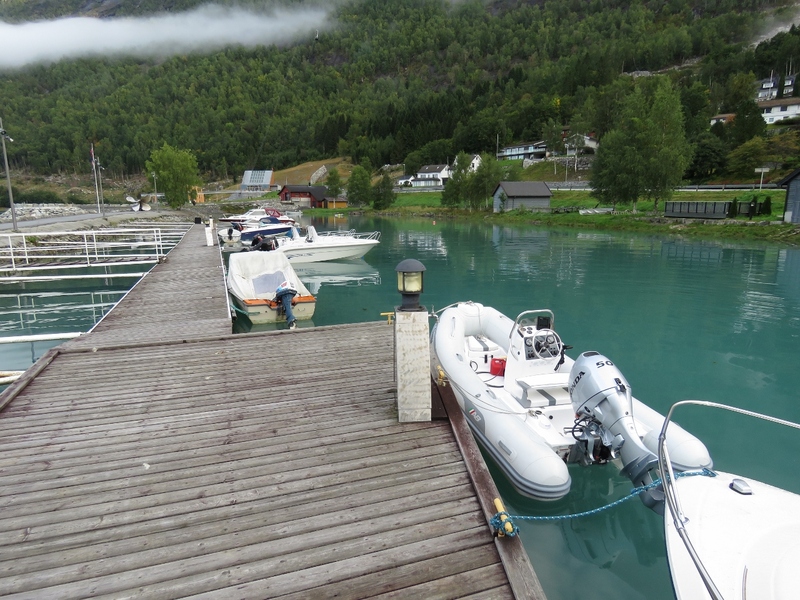 After returning back to sea level, we ran the tender over to the nearby town of Olden. This is looking back to Mt Hoven en route. 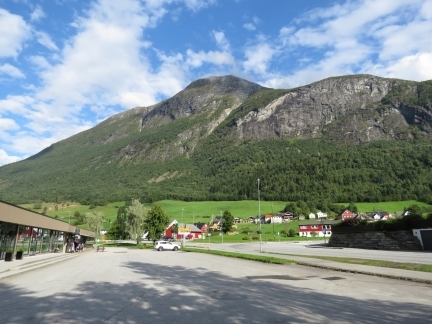 Hoven restaurant and the Loen Skylift station are just visible at the top of the hill slightly right of center. Looking east to the hills above Olden. 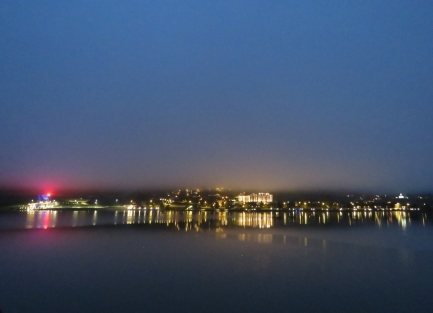 The town is quiet today, but that will change when the cruise ship Britannia arrives tomorrow. 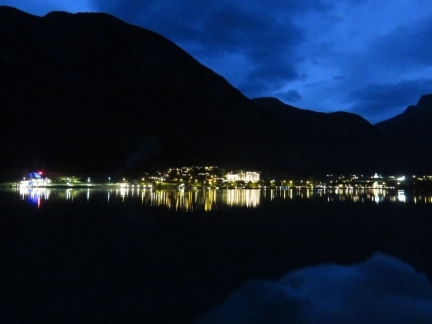 The lights of Loen reflecting into still waters on a misty dawn at Loen. 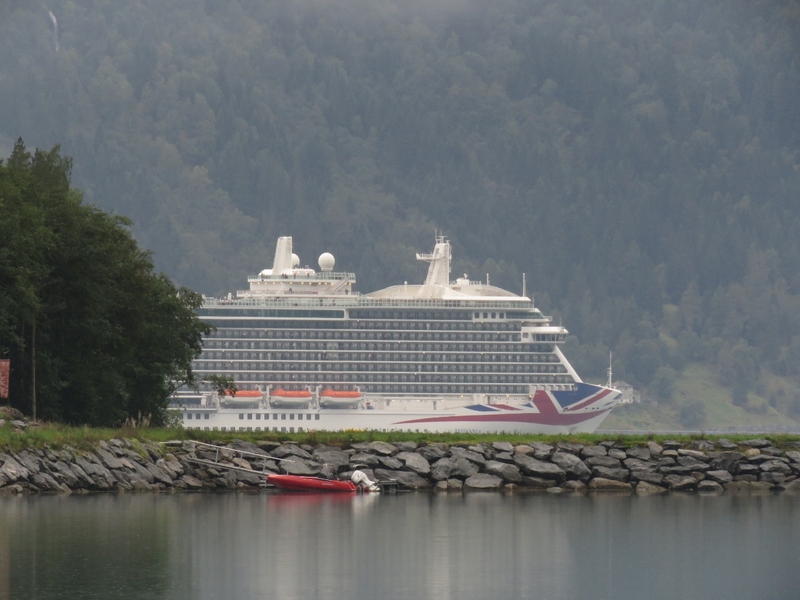 The cruise ship Britannia arrived into Olden this morning and we’ve seen a flurry of activity all day, including tour buses, high-speed adventure boats and helicopter rides. The 1,083ft (330m) cruise ship Britannia filling the view to our south as the ship departs Olden. Ending the day the same way we started—with reflections from the lights of Loen, this time with clear skies. The photo titled “Dirona” stood out to me as one of the most spectacular shots of many spectacular photos you’ve taken. Terrific. Whew, the wire bridge looked nerve-wracking, even if you were clipped on. We were lucky with really great weather. On the bridge, you are 100% right. I was having some serious doubts on the first 1/2 of the way across. Awesome! One day I’ll do the Via Ferrara too! Seems like you had a spectacular view and a great adventure. 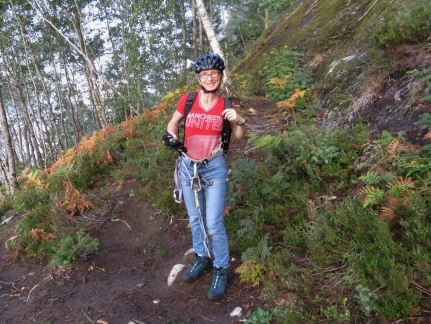 We did have a great time on the climb. 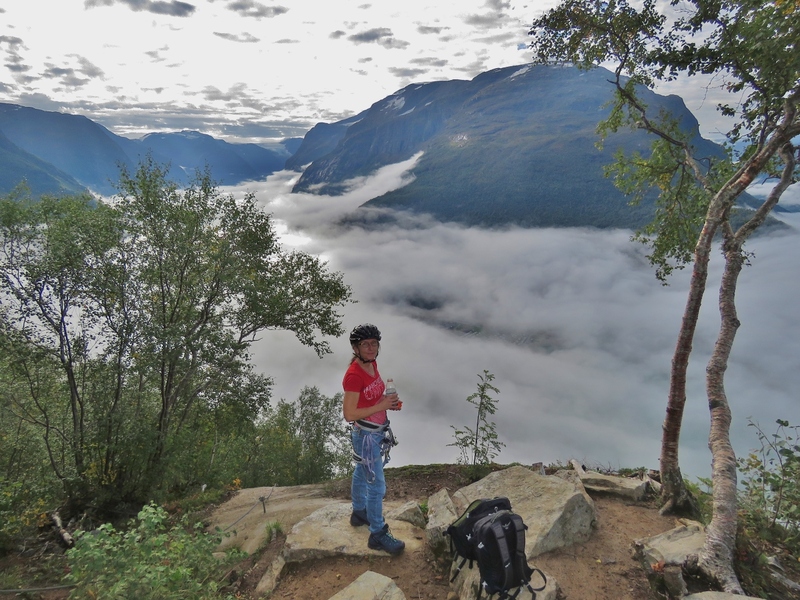 Our normal excuse for doing these big adventures is the view from the top and this one certainly had that. 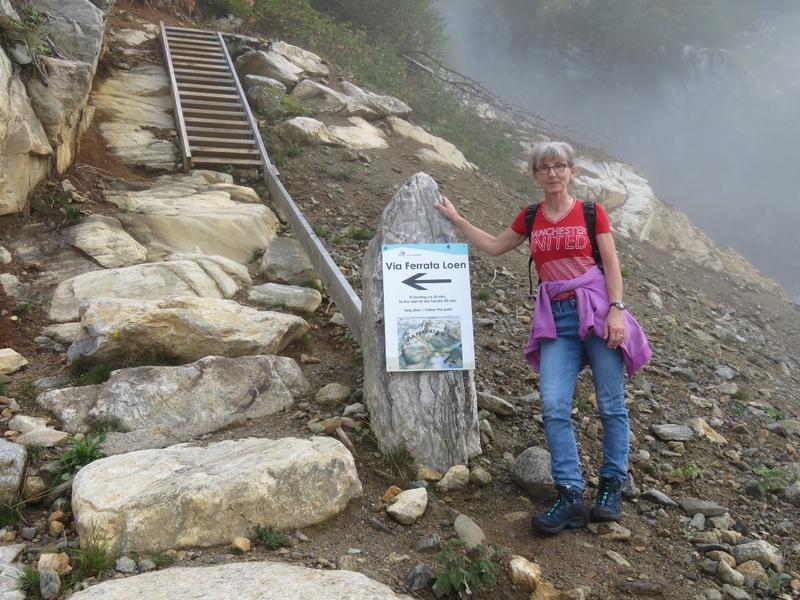 But with a cable car ride available to the top, there certainly are easier ways to do it so we have to admit the climb was part of the fun :-). Worth doing.